Several new recent Houston DJ reviews have come in for us on Yelp, Facebook, and Google. There is nothing imaginable that helps our business more than when brides and grooms take a moment to share their thoughts. We often deal with brides that are very uneasy and nervous about hiring a DJ. We completely understand because there is little to go off of, which is why a huge portion of our events are from referrals like venues and wedding planners. There is no way to truly know the value of our services unless you have worked a full 4 or 5 hour event with us. 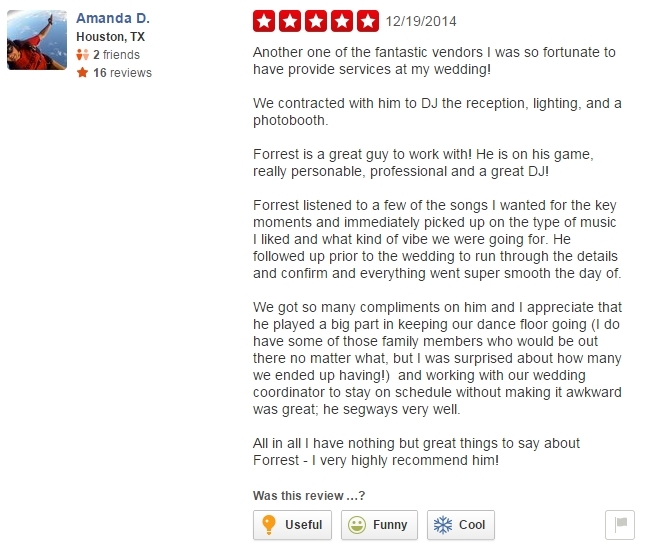 If you are tired of looking at Houston DJ Reviews, simply give us a call today. For over 15 years, we have provided top level DJ service in this market and understand what makes the perfect event from the background music to the dance portion. Although we specialize in weddings, we also specialize in corporate and school events, and are known for getting the most dancing possible out of our crowds. Contact us today!